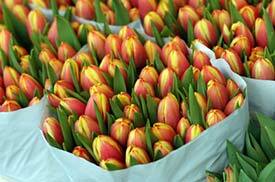 ABOVE: Packages of tulips in Amsterdam's floating Flower Market. This page gives a nice overview of shopping in Amsterdam, and it has links to other pages about specific areas or types of merchandise. The guidebook publisher lists or reviews stores by category and location. Amsterdam's ABC claims to be the largest source of English-language books in Europe.